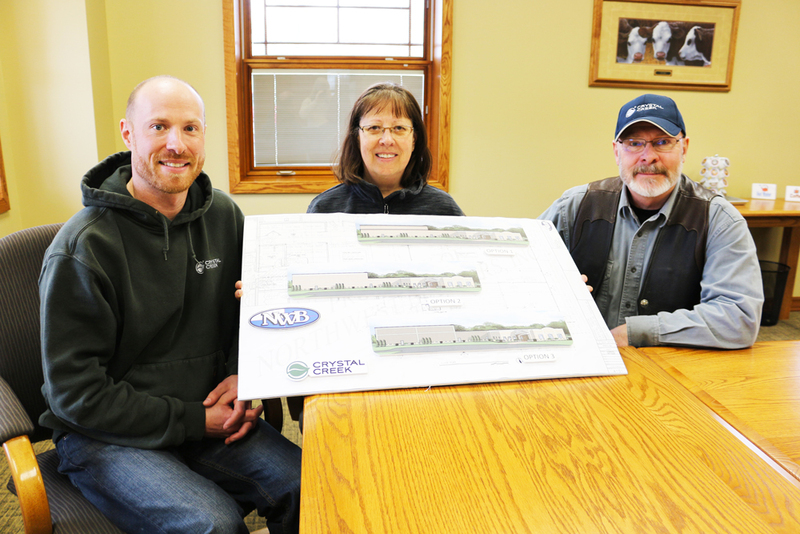 If past history is any indication, that may well be the thought as Dan, Jan, and Ryan Leiterman stand inside Crystal Creek’s newest warehouse expansion project, now under construction. Crystal Creek® provides nutritional supplements and animal health aids for livestock across the United States and Canada and was founded by husband and wife team Dan and Jan Leiterman in 1997. In 2012, their son Dr. Ryan, joined the family business as the company’s staff veterinarian and newest business partner. Crystal Creek’s birth, like some notable companies, was in a garage. 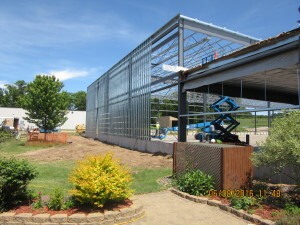 It relocated to a newly built 40-by-80-foot warehouse in Trego in 2001, which the Leiterman’s thought was “way too big” once they moved the company into it. Crystal Creek® soon outgrew that, and a 17,000-square-foot office and warehouse were constructed in Spooner’s industrial park in 2007. It, too, seemed enormous at the time. The latest addition, a 31,820-square-foot heated warehouse with portions of it spanning 30 feet high, is expected to be completed by September. Built by Northwest Builders of Rice Lake and using all local labor, the project will provide jobs for more than 100 skilled tradesmen during the course of construction and will greatly multiply Crystal Creek’s capacity from the current 12,000-square-foot warehouse. The Leitermans planned for growth from the start with the construction of their office and warehouse in Spooner, from the size of the five-acre lot, to the watershed management plan, to placement of the parking lot; everything was planned for expansion. The current office space can be tripled in size if needed in the future. “It’s all been set up for expansion, even back in 2007 we were planning for future office, warehouse, parking lot and loading dock space,” Ryan said. How did they know they would expand? The company has 14 employees, with two of them added just this year due to growth. Ryan said the company has experienced strong sales growth every year, with especially robust growth over the past year. Dan is very optimistic about the future. Not only is Crystal Creek® part of the customers’ team, the Leitermans are friends that get invited to customers’ weddings and receive Christmas cards and birth announcements from them. All of the Leitermans attribute their company’s growth to a team attitude and innovative products geared toward what the customers need for healthy, productive livestock. The company’s focus is helping the customer grow more sustainable, healthy animals, which helps lead to more productivity and thus greater profitability for the producers. That sense of staying ahead of the curve extends beyond the nutrition to the broader area of year-round calf barn ventilation through the patent-pending fan and duct designs called FLIP DUCT® and FLAP DUCT® that Ryan invented. More producers are building barns to house their calves, especially for the frigid winters, and these ventilation technologies give producers greater control over providing fresh air to the calves during all seasons. That project has brought together Ryan’s personal expertise and background in agricultural engineering and veterinary medicine and merged it with the company’s livestock health and nutrition emphasis. “There are multiple things that make our company unique, but the ventilation is one aspect in which we are able to provide services that no other company can,” he said. The ventilation portion of the business potentially could take root overseas. It took confidence, and plenty of capital investment, for the family-owned business to plunge into the new venture. What that tells the producer, he said, is that Crystal Creek® is there as a team member, not a salesman, and that fosters long-term relationships. “It’s very satisfying,” Dan added. Part of the benefit for the livestock is that Crystal Creek’s formulations use high-quality, bio-available ingredients, Jan said. That has numerous advantages. Poultry research, for example, has shown that birds given more bio-available feed produce more nutritious meat and eggs. “We think it is very important to educate our clients,” Jan said. Marketing – including a website and a comprehensive glossy catalog – has helped get that information out to local producers and beyond, but much of Crystal Creek’s growth has come through word of mouth from satisfied customers. The companies they partner with have strong research, resources, and technology behind them, matched with business philosophies shared by Crystal Creek®. While Crystal Creek® has moved in the past, the Leitermans say they love being in Spooner, with its high quality of life and the outdoors, welcoming community, attractiveness to families, and business-friendly support. Their new warehouse is a commitment to the community as well as their customers.